Screeching of Guls, wushing wind, waves rythmically shifting shingle, the humming Nuclear Power stations. 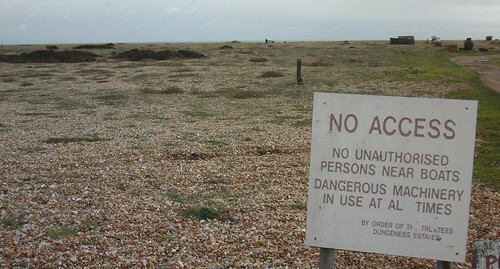 No persons, authorised or otherwise, near the scattered boats. No sign of the silent, dangerous, machinery that is in use at all times. No walls, fences, or barbed wire re-inforced the message of no access. Just the signed threat. This scribble was published on Tuesday, March 1st, 2011. You can follow any banter on this scribble with the RSS 2.0 feed. You can share your inspired musings after typing the anti spam word near the bottom of the page. But no Pinging because its too naughty.